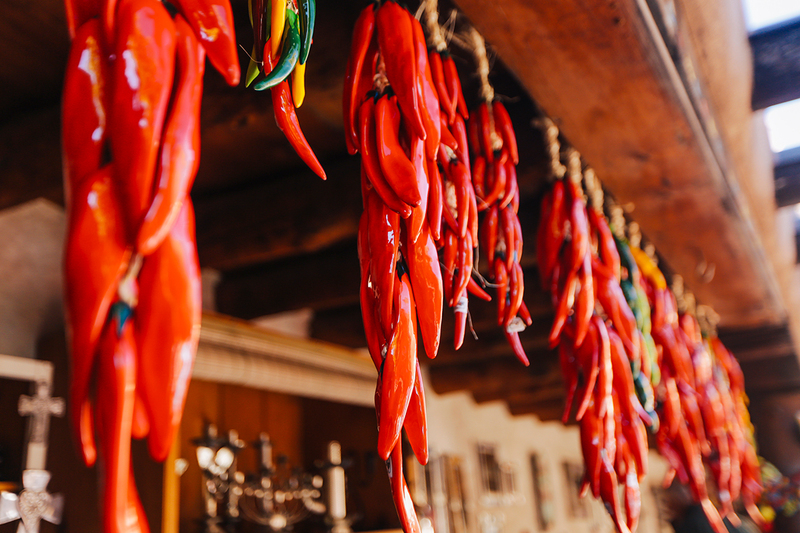 I’d never been to New Mexico before – it wasn’t even on my bucket list. 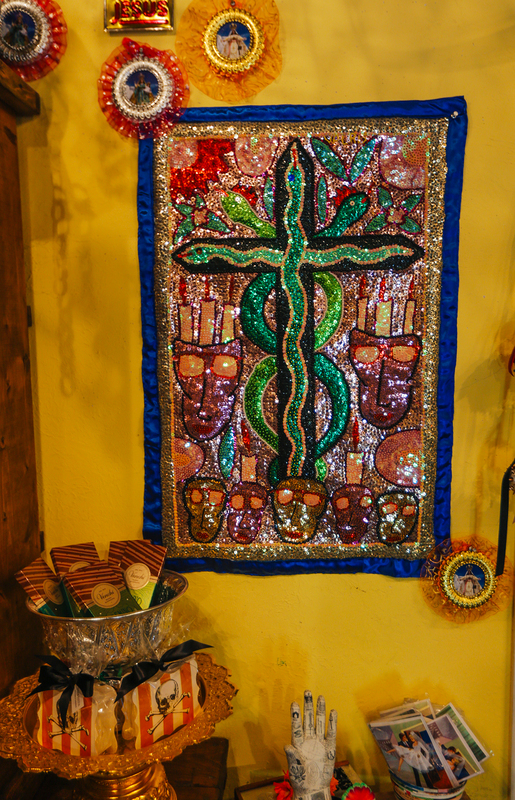 But after spending a fall weekend in Santa Fe, I’m anxious to return. 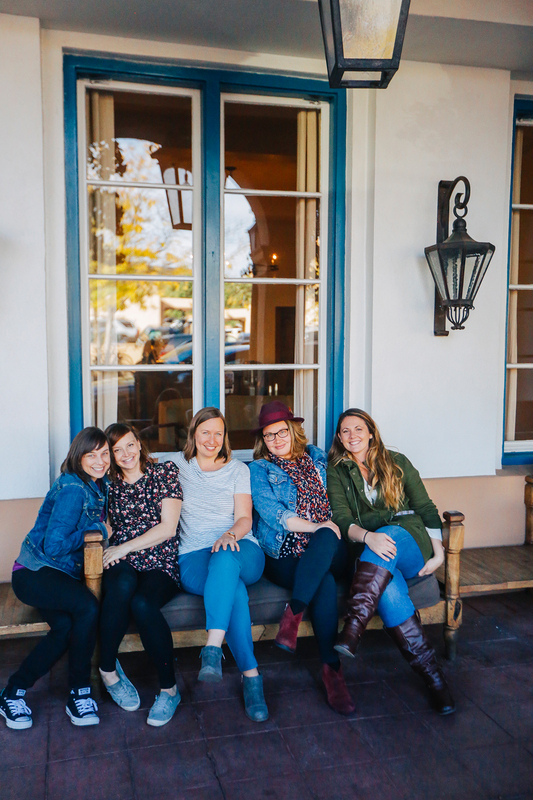 On a whim, my friend Chelsea invited me to join her and three friends on a ladies weekend. 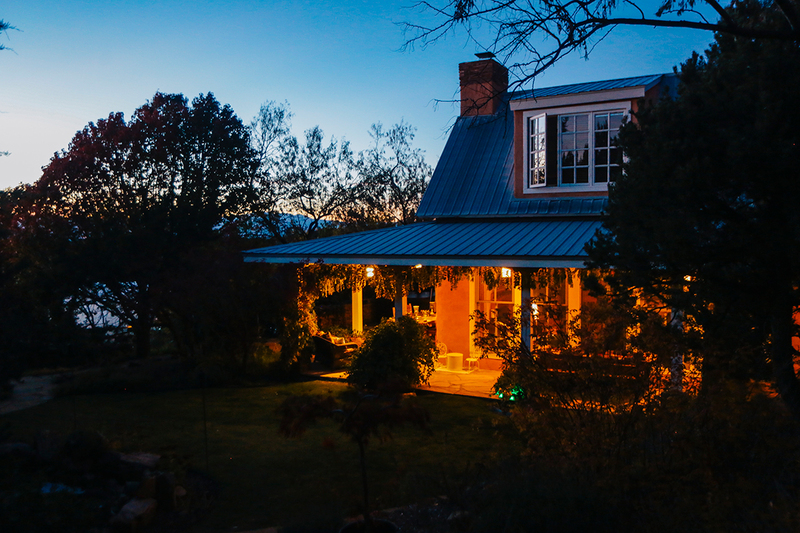 She let the rental dictate where we went, and this glamorous retreat stole the show. I’ve always wanted to throw a dart at a map and go wherever it landed; this is a more sophisticated version of that. 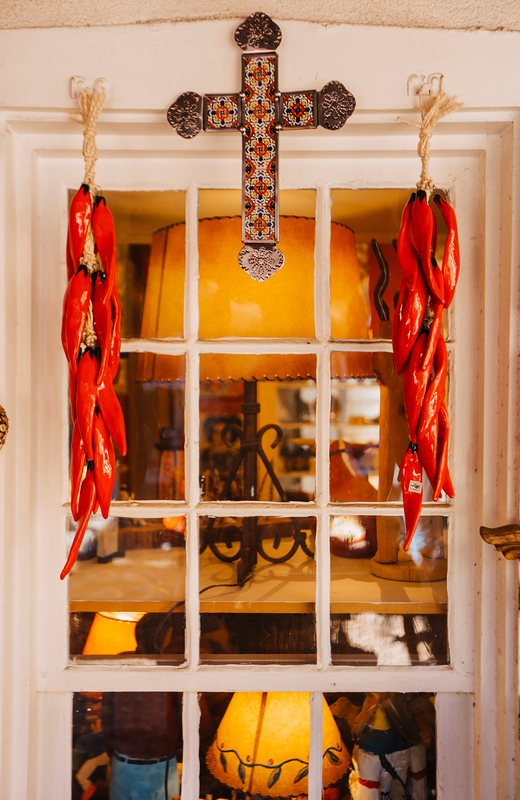 You could easily spend a week or more in Santa Fe, but if you only have a short time in the state capital, here are eight tips to make every step count. I’m not a huge fan of walking tours. I think they tend to be more of a “spend money at this local establishment” tour. I generally prefer to head out alone and explore the streets myself. 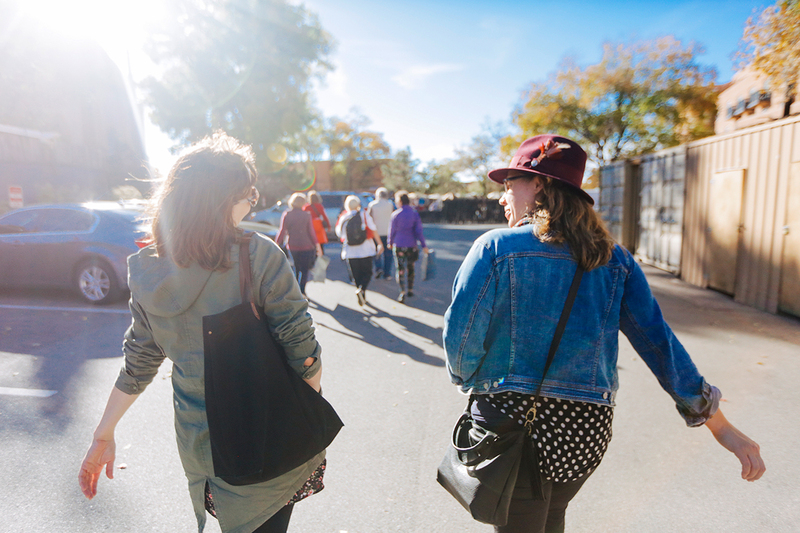 But if you’re in a group, a walking tour is a great way to get to know a place. 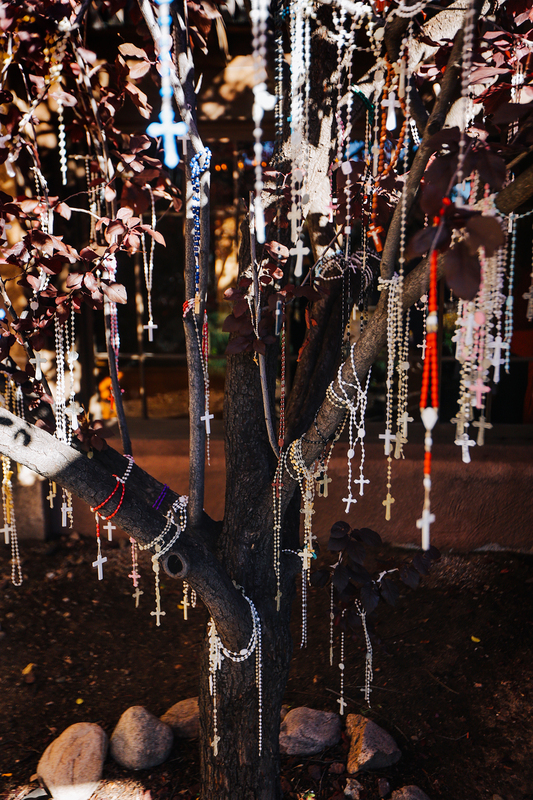 If you head out with Historic Walks of Santa Fe, you’ll also gain access to some local chapels and learn about New Mexico’s vibrant art scene. Like I said, I tend to head off on my own, and I definitely did on this tour. I’m often the last to rejoin the group because I’m busy taking photos, and I’m not always paying attention to what the guide is saying. 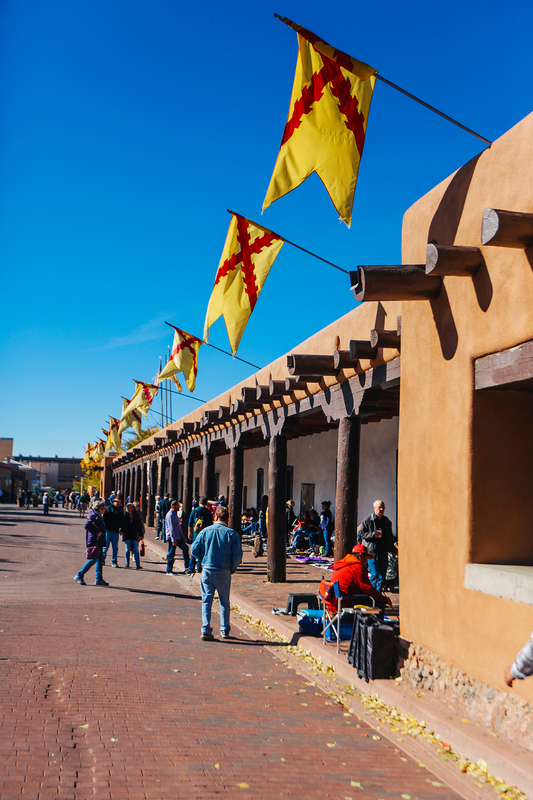 But this was a great way to see the heart of town and learn about the Pueblo architecture that is prevalent throughout Santa Fe. 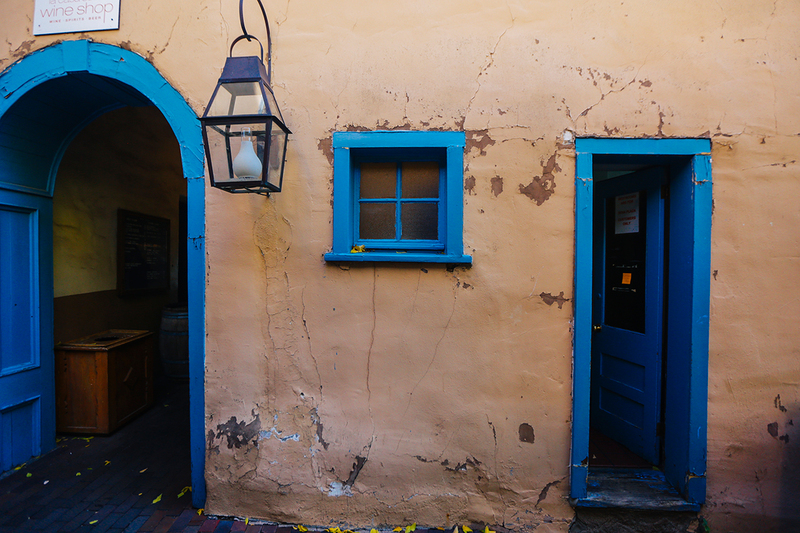 • No reservations are required, and tours are $15 – cash only. 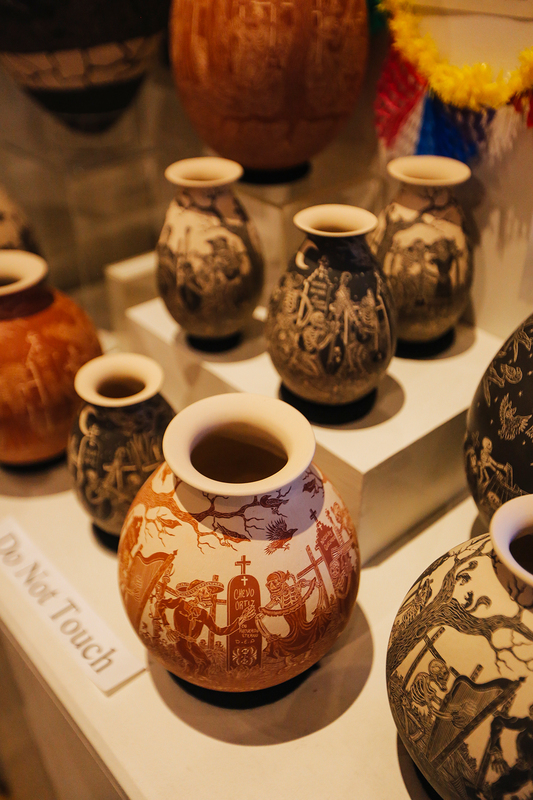 • Bring extra cash to the Palace of the Governors where native artists are selling jewelry, ornaments and more. • The tour stops at three hotels for pickup. 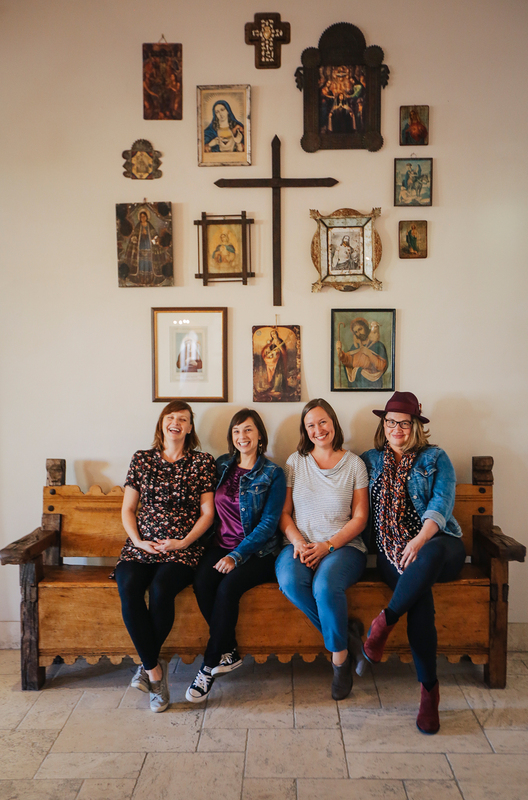 We met up with the group at the third and final Hotel St. Francis – a great stop for photos with a public restroom. 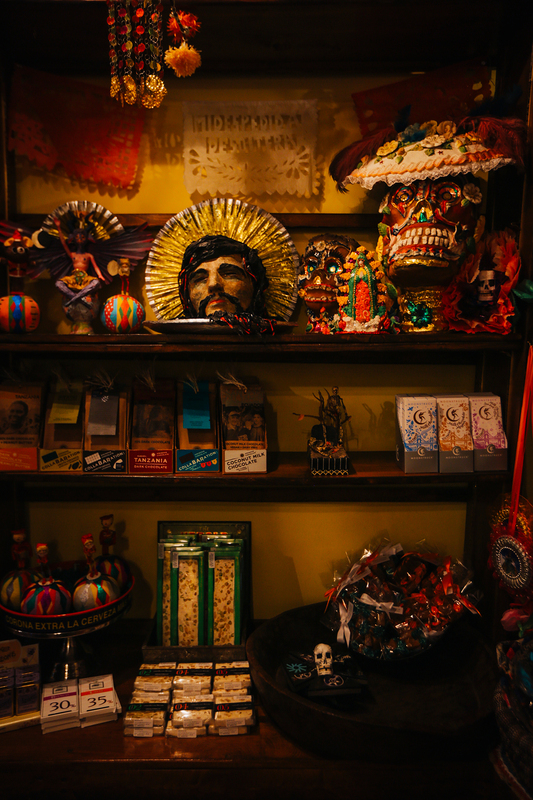 • Buy some delicacies at Todos Santos Chocolates. 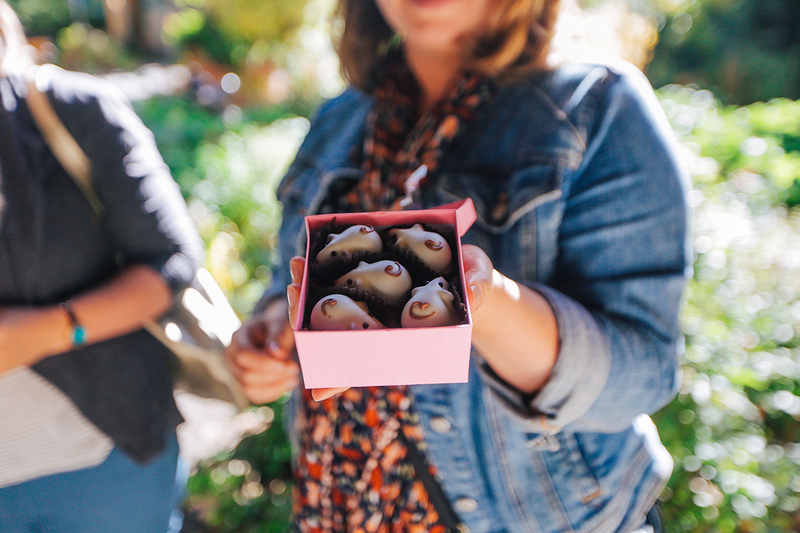 Not only are the chocolates delicious, but you’ll be inundated with art, both kitschy and intricate. 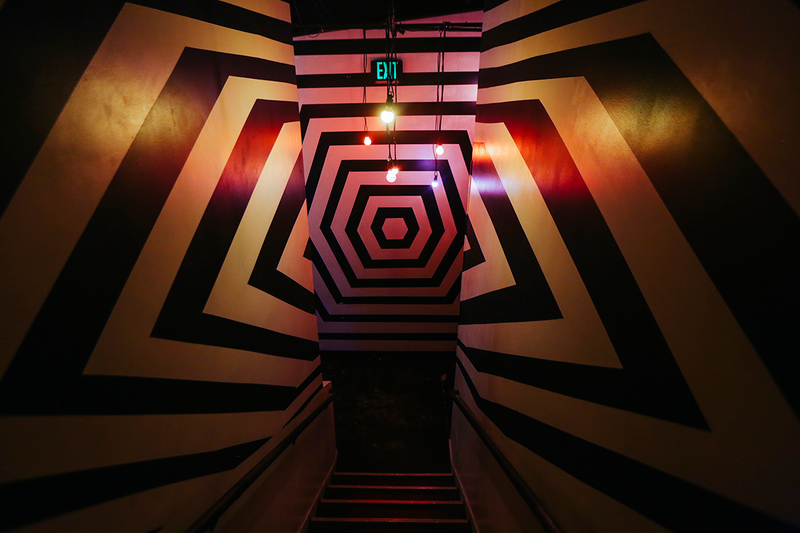 The disco ball entrance will entice all. 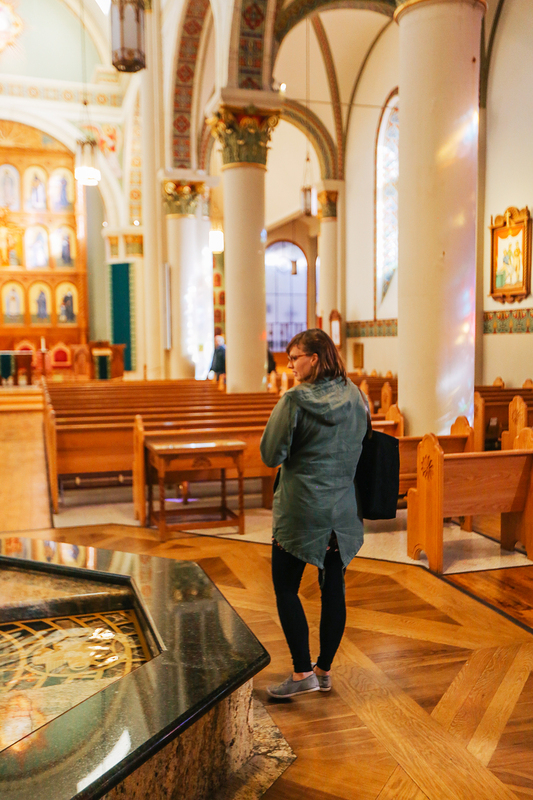 If you’re like me and prefer to walk around on your own, be sure to spend some time in the downtown churches and chapels. 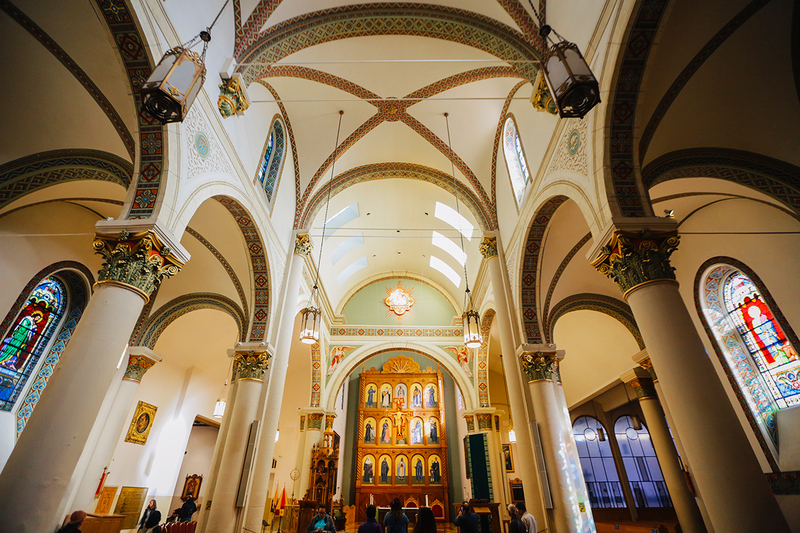 The Cathedral Basilica of St. Francis of Assisi is grand inside and out. 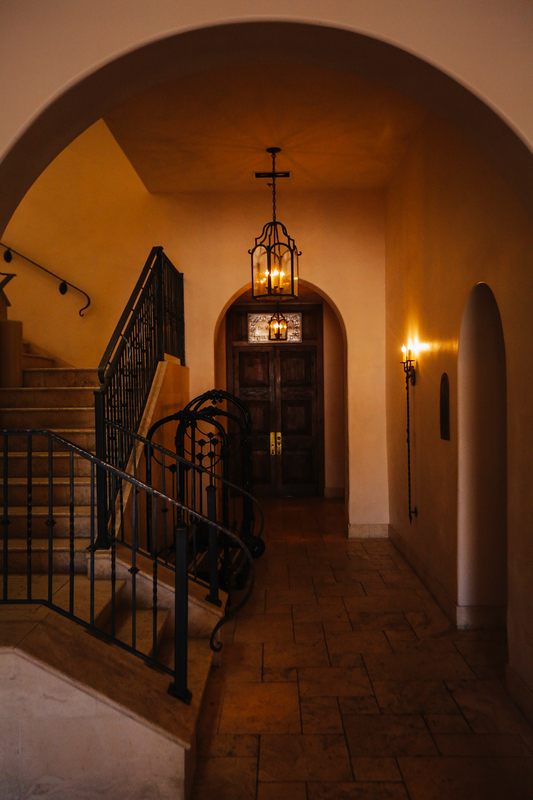 Its Romanesque Revival architecture features intricate tiles, archways and gothic rose windows. 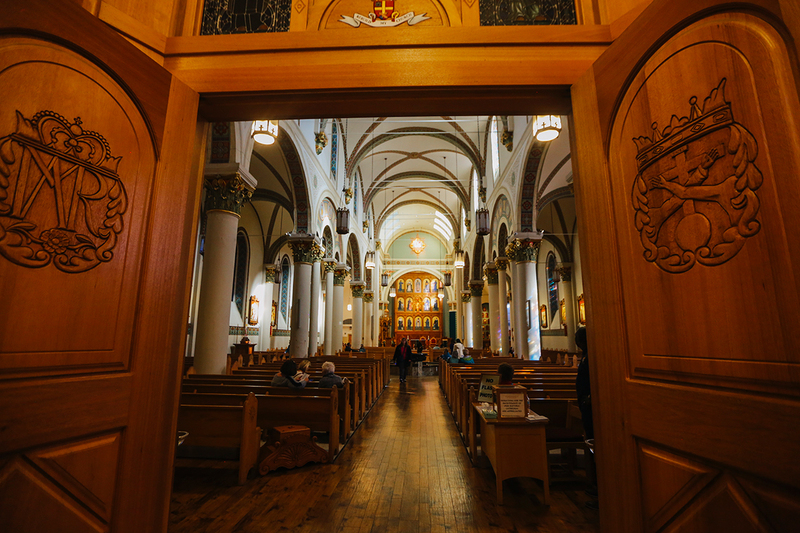 This is an operational church, so be respectful of those praying inside. 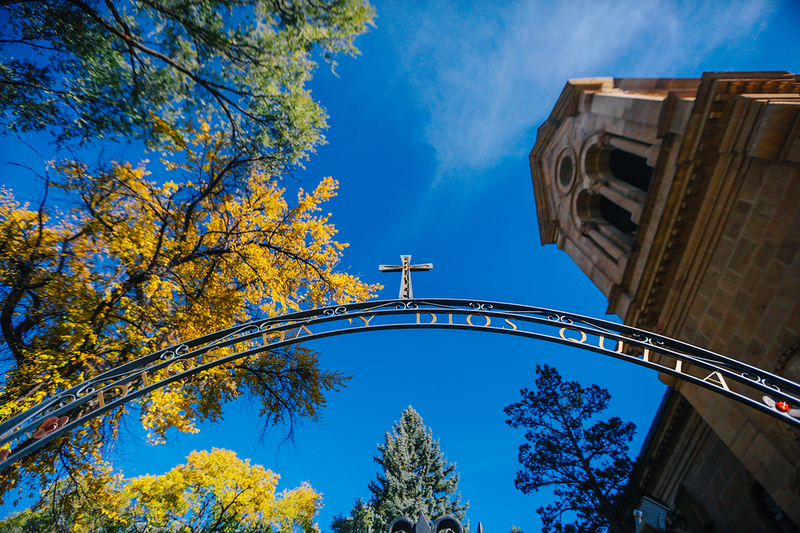 The smaller Loretto Chapel is also a must-see but is much more of a tourist destination. If you’re looking for a place to worship, this is not your stop. A recorded history fills the chapel with a brassy voiceover making feelings of spirituality near impossible. 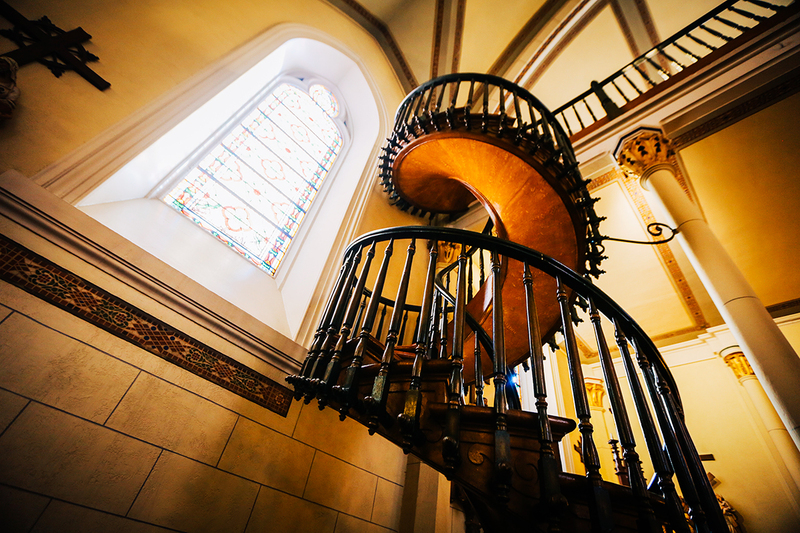 The chapel’s miraculous staircase is its claim to fame. 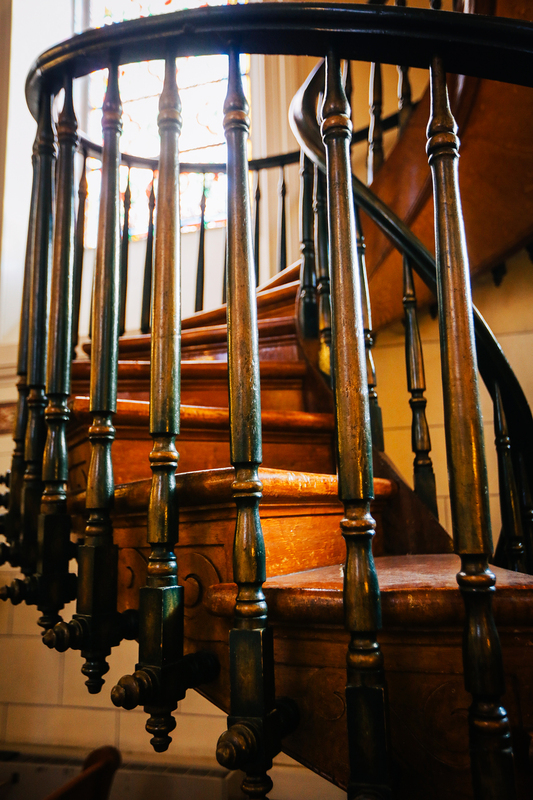 Legend has it that in 1873 a carpenter volunteered his time to build the staircase with simple tools and wooden pegs. Amazingly, the structure features no center pole for support, yet completes two 360 degree turns – its entire weight rests on the bottom stair. Once construction was complete, the carpenter disappeared without payment never to be heard from again. Some believe the man was St. Joseph himself, answering the Sisters of Loretto’s prayers, while others believe he was sent by St. Joseph. 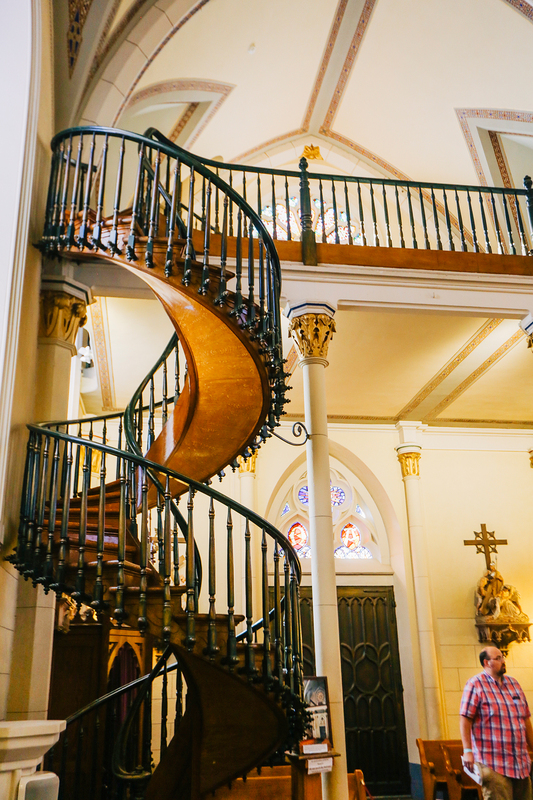 Whether or not you’re one for miracles, the staircase is beautiful, as are the stained glass windows and pulpit inside. 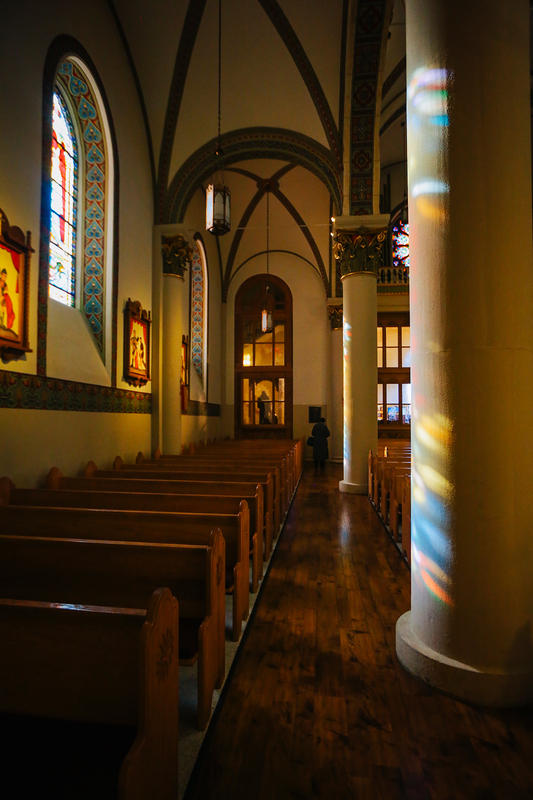 • Cathedral Basilica of St. Francis of Assisi is free to the public. Be respectful of those worshipping inside. 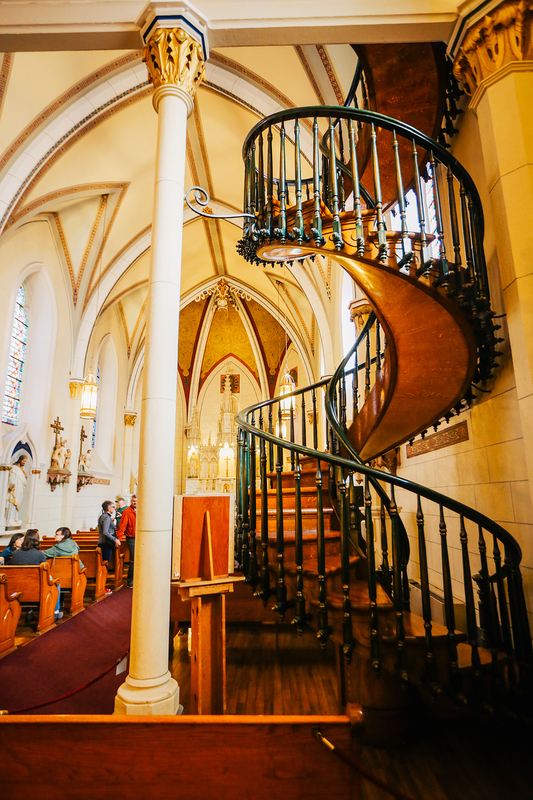 • If you visit Loretto Chapel without a tour, it will cost $4 per person. • The miraculous staircase is roped off, so you won’t get a view from the top. 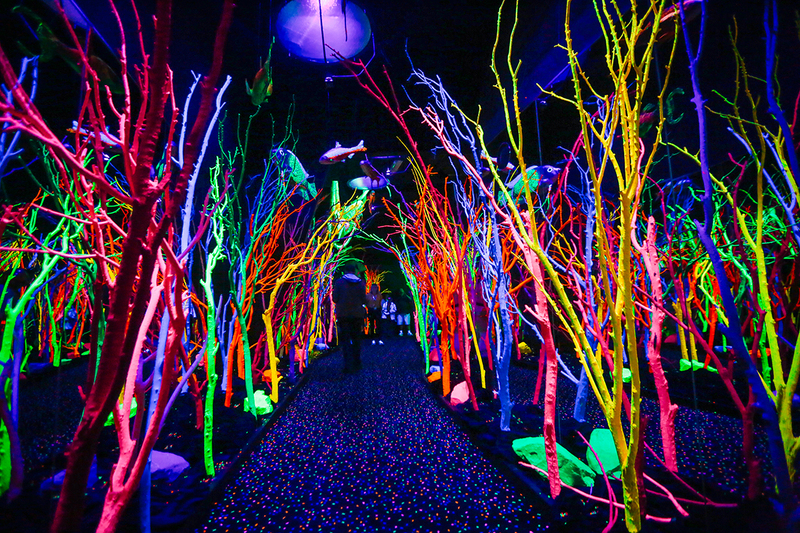 An “Immersive experience” is an accurate, if not perhaps modest way to describe Meow Wolf. This sci-fi-charged puzzle will leave you speechless, curious and, if you’re like me, a bit overwhelmed from the sensory overload. 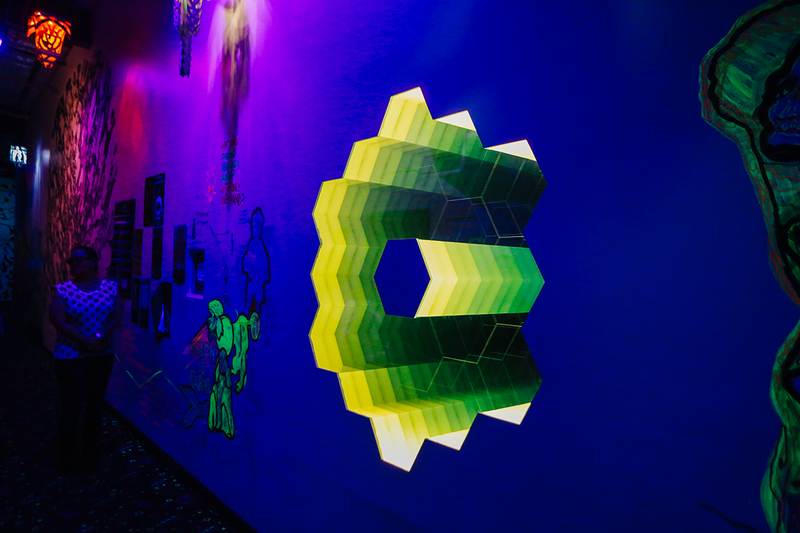 At every turn you are met with a new visual delight created by artists of every kind. 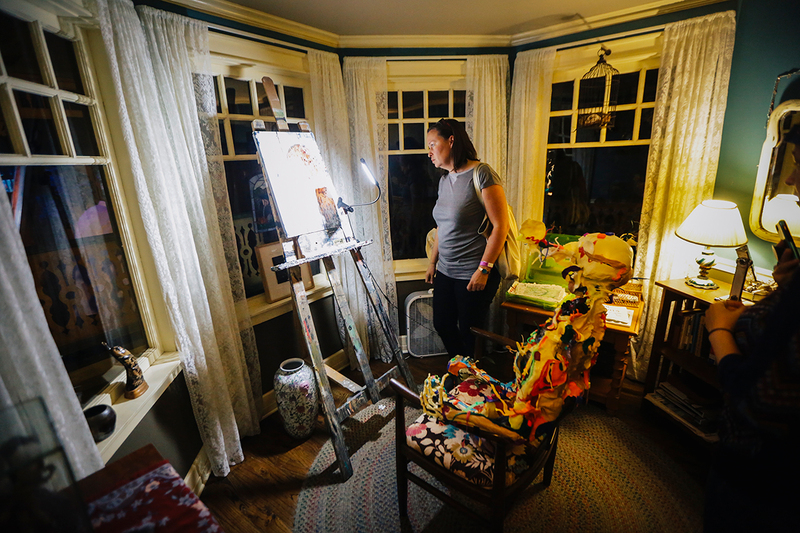 Half of the Meow Wolf experience is the exploration, so I don’t want to give too much away. But I can tell you that you’ll play music on a dinosaur, travel through a Fern Gully-esque forest and find yourself climbing into a variety of household appliances. 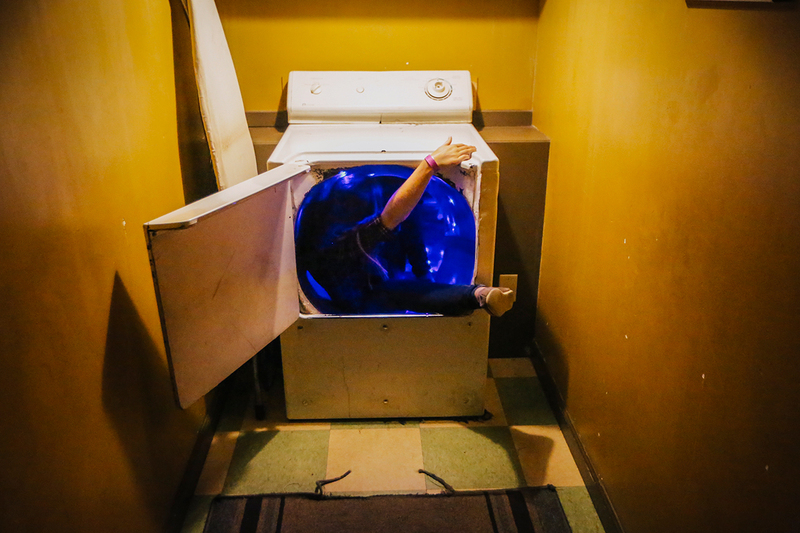 No matter how long you’re inside this converted bowling alley, Meow Wolf’s multi-story house will lead you through multiple dimensions and leave each of you with a unique experience. 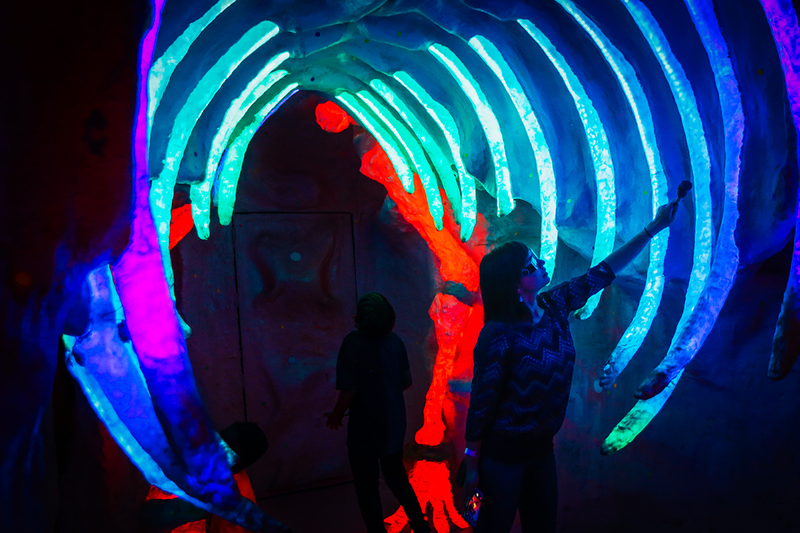 • Meow Wolf is only $25. You will be offered 3D glasses for $1 extra. While these are great for the graffiti outside the exhibit, I didn’t find they added much to my experience inside. • Kids are welcome and in full attendance, but be warned that there will be a lot of running around. Consider going alone for the first time and bringing the kids along for the second trip. • If you’re hungry, there are multiple food trucks outside, ranging from snow cones to Mexican fare, as well as food and bar inside the building. • I recommend going early. The parking lot was completely full when we arrived, so we had to park in a neighborhood about a block away. If you’re claustrophobic, get there early to avoid the crowds. This house has pretty tight quarters! 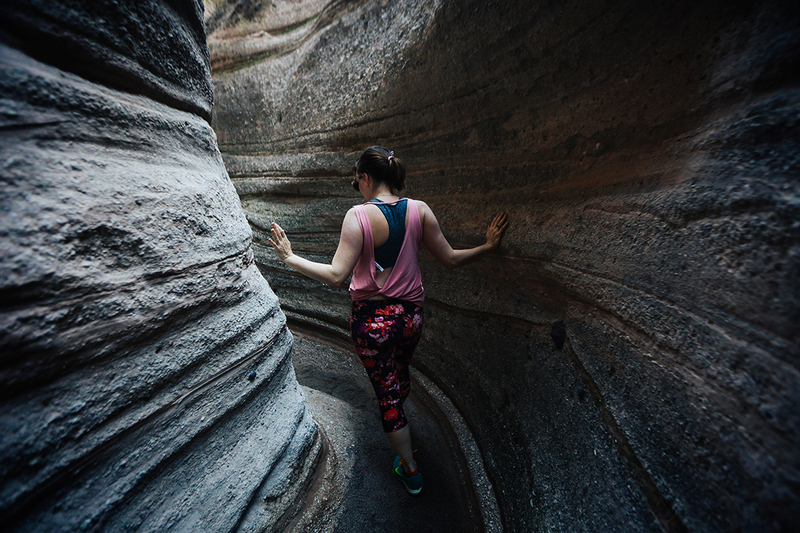 • Explore every nook and cranny; don’t have a hard stop time. Give yourself some time to breathe afterward. You’ll probably need some time to decompress. 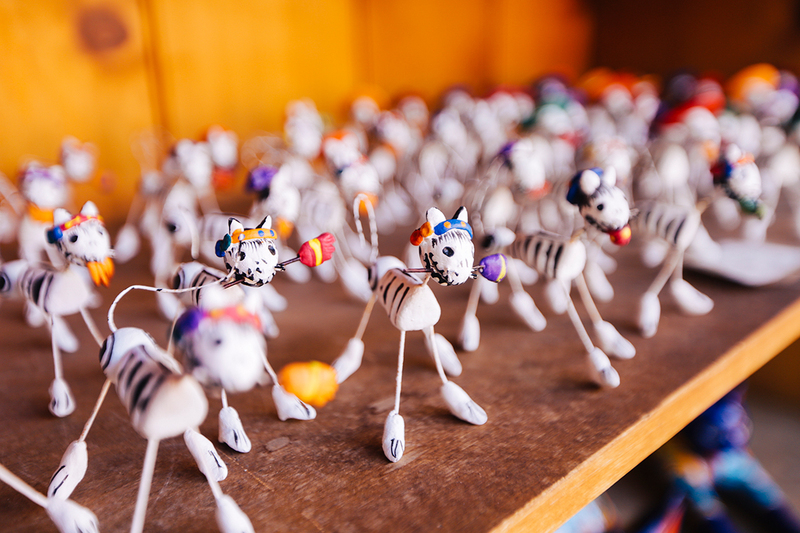 Santa Fe is home to so many amazing craftsmen and artists. 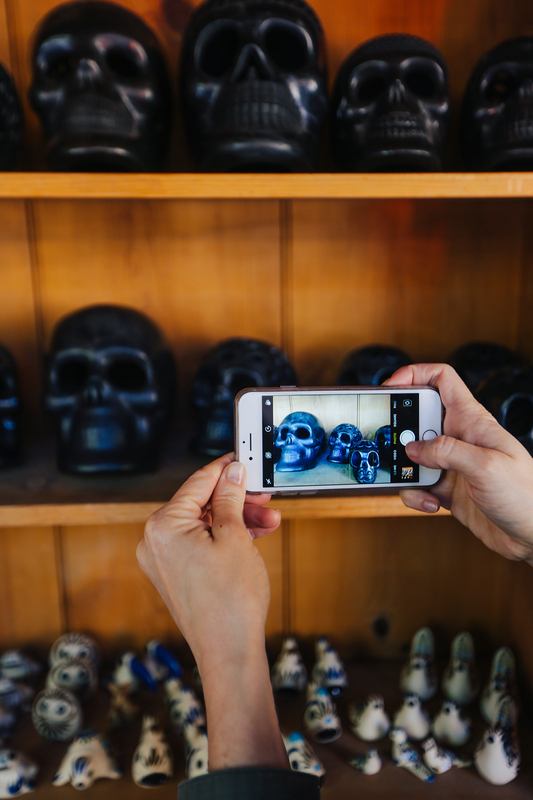 Each shop is unique – you won’t find the basic tourist t-shirt peddlers here. 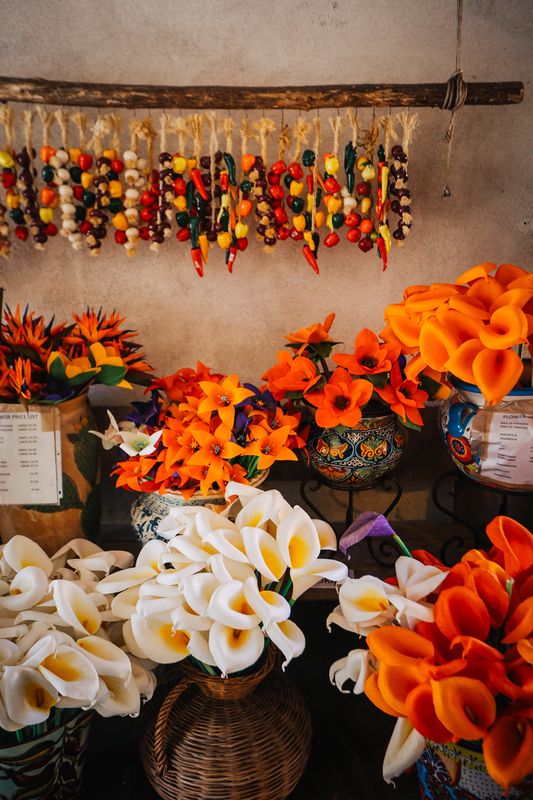 These local shops feature a variety of pottery, faux flowers, ornaments and more. 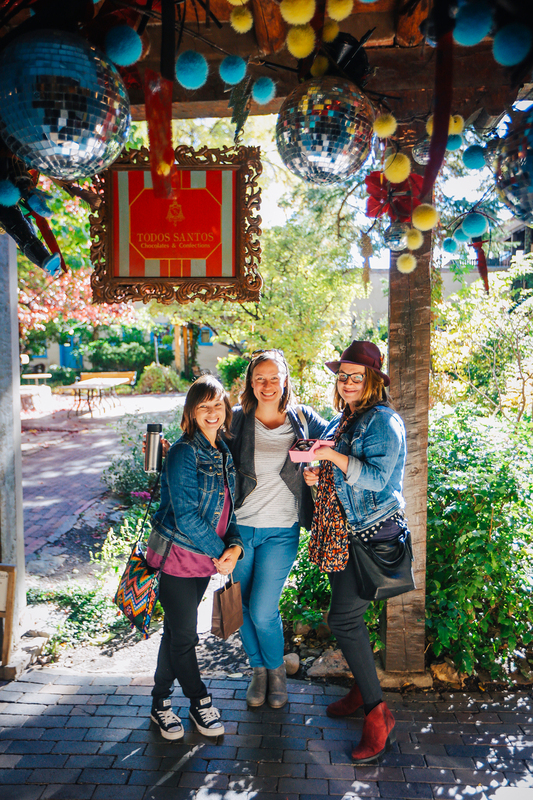 If you take time to walk through downtown, you’re sure to find something you just can’t leave without. 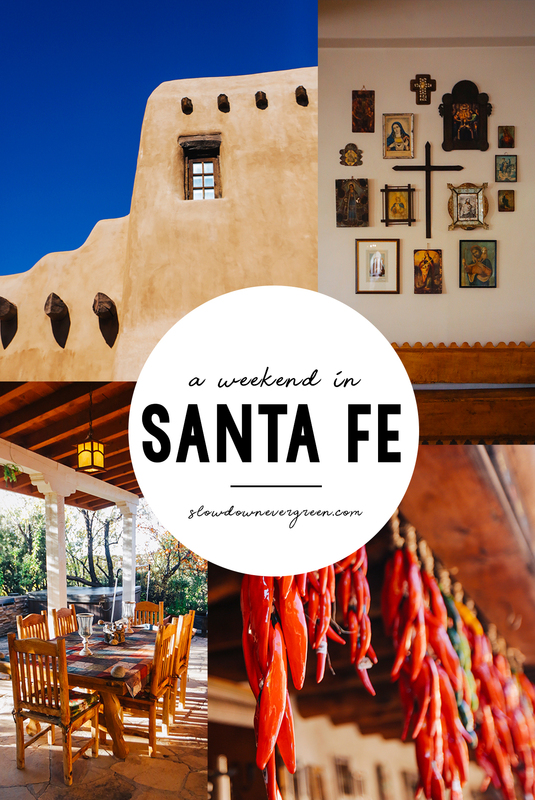 If you have access to a kitchen, I highly recommend visiting the Santa Fe Farmers’ Market. 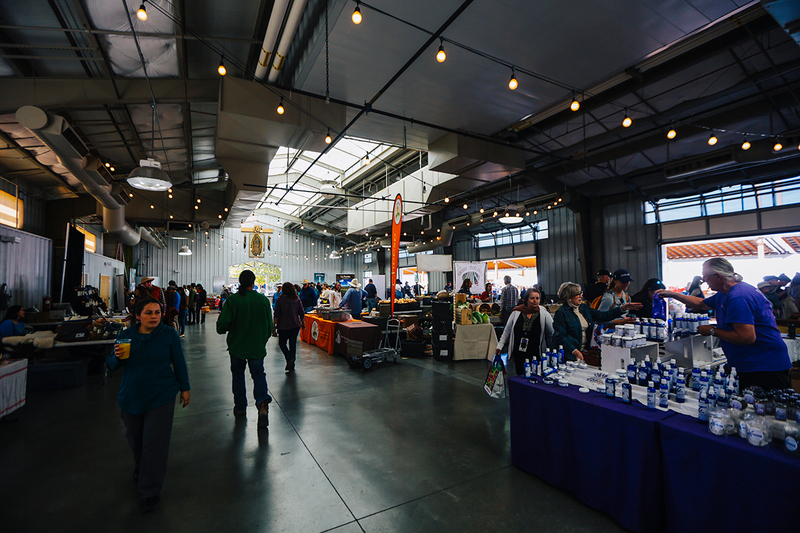 You’ll find an array of booths overloaded with fresh produce, bread, goat cheese and more, as well as local artisans and jewelers. 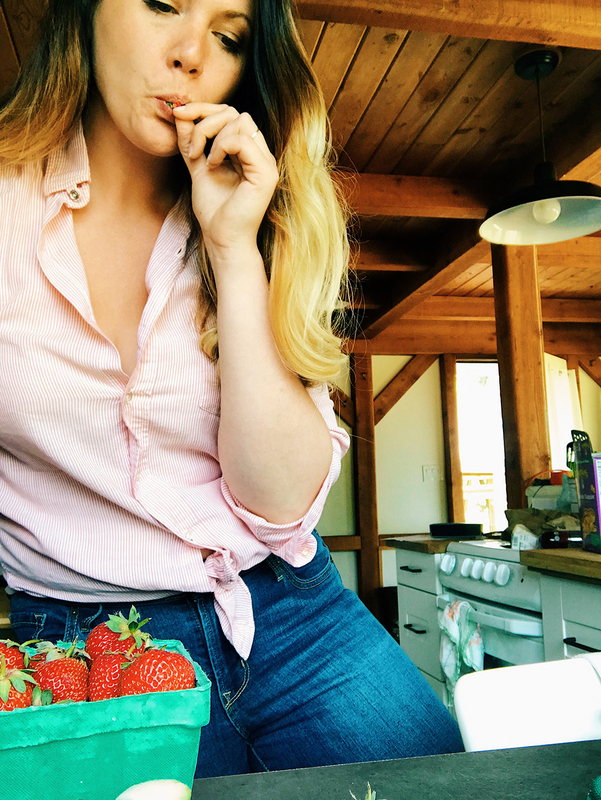 Even if you aren’t able to cook during your stay, go ahead and grab a crisp apple. You’ll be glad you did! 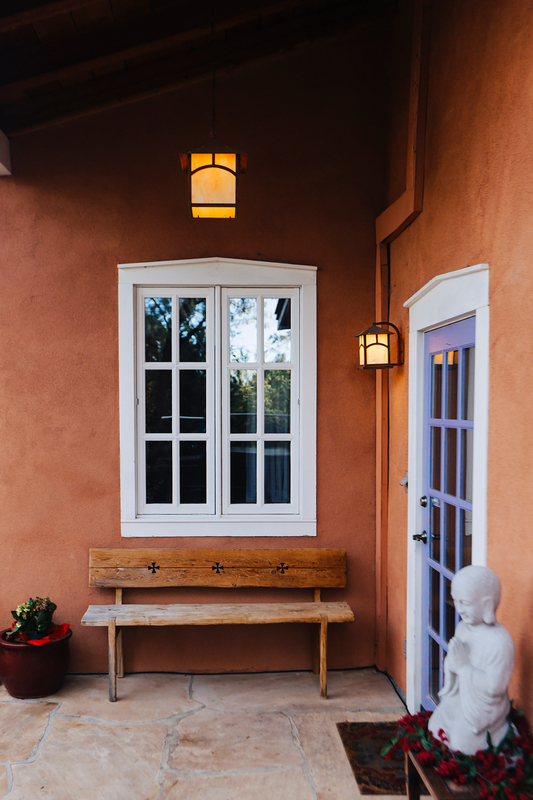 • If you have a deep appreciation for the arts and happen to be in Santa Fe on the fourth Friday of the month, don’t miss the gallery walk down Canyon Road. Galleries are open until 7 p.m. and feature refreshments and entertainment. 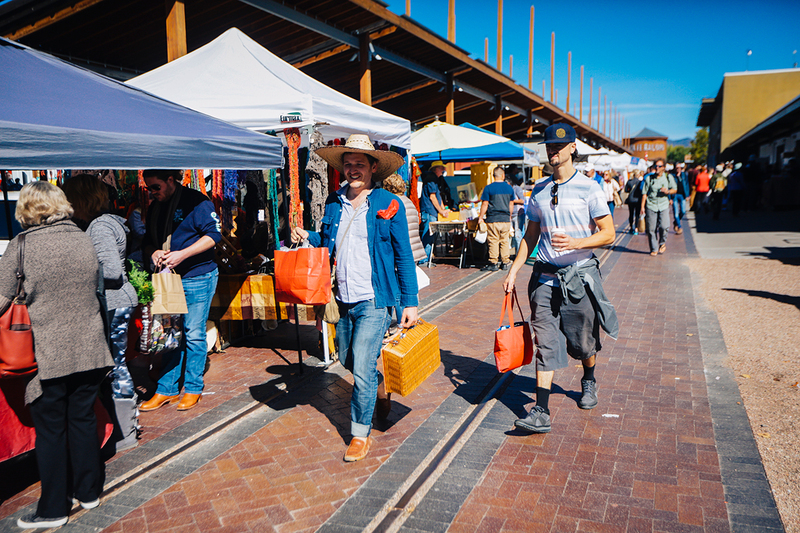 • Engage the vendors at the farmers’ market. You’ll probably learn a thing or two, like the fact that goat’s milk gets its “goaty” taste from the musk of male goats. Want your goat cheese to taste less “goaty?” Keep the males and females separate until it’s time to breed. 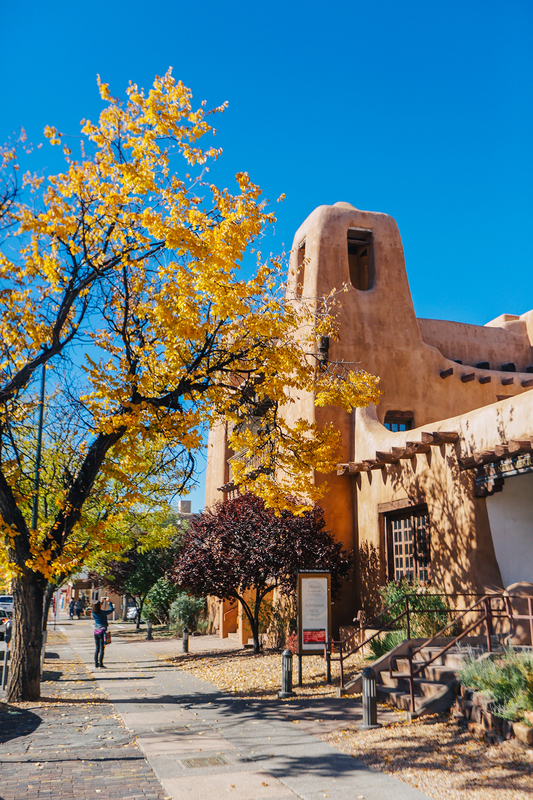 I can’t really say this with authority, as I’ve only visited New Mexico once, but after visiting in the fall, I don’t know why you would want to go at any other time. 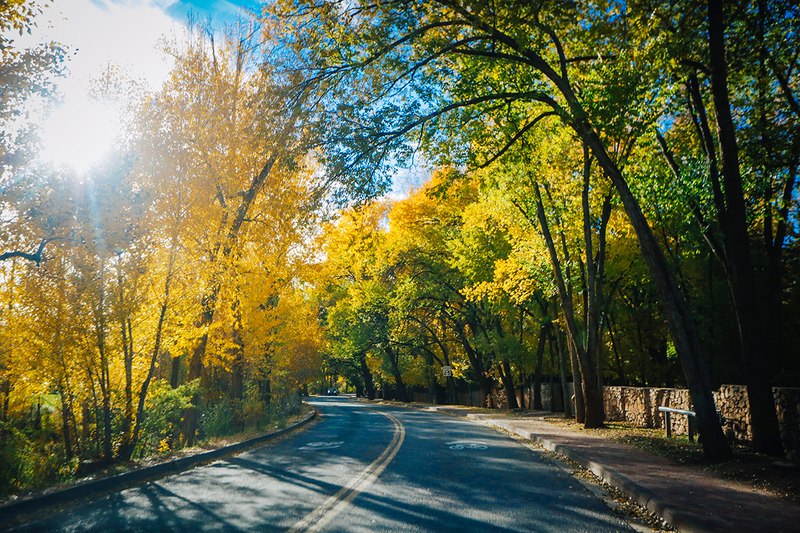 Santa Fe boasts 364 days of blue skies a year, but those blues are made even more beautiful by the hues of yellow and orange that accompany autumn. Not only are the colors beautiful, but the weather is ideal. We never broke 70 degrees, and only saw clouds when they complemented gorgeous sunsets. 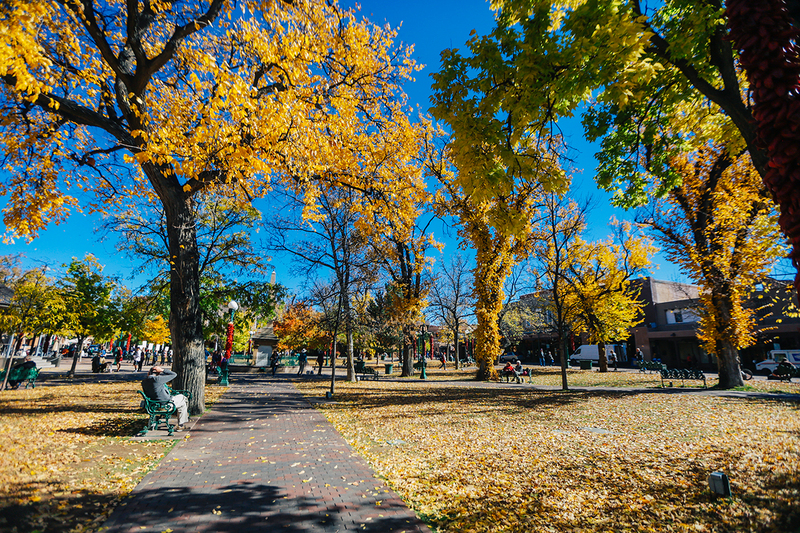 If you can only go once, go when the colors are changing and the air is cool and crisp. • Santa Fe is in the desert, so it’s extremely dry. In the fall and winter, it is especially so. Bring your lotion and moisturizer to avoid cracking cuticles and bloody noses. 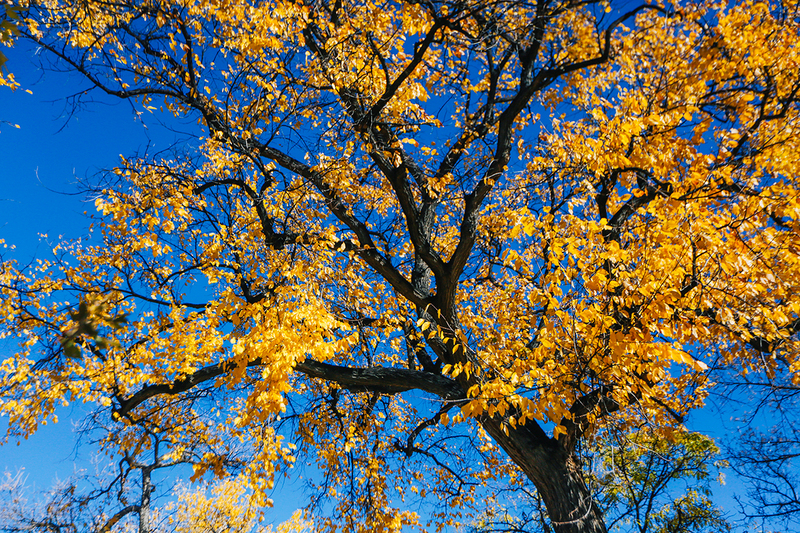 • The big trees with dark trunks and bright leaves are Cottonwoods. I’m just saving you some Google time. 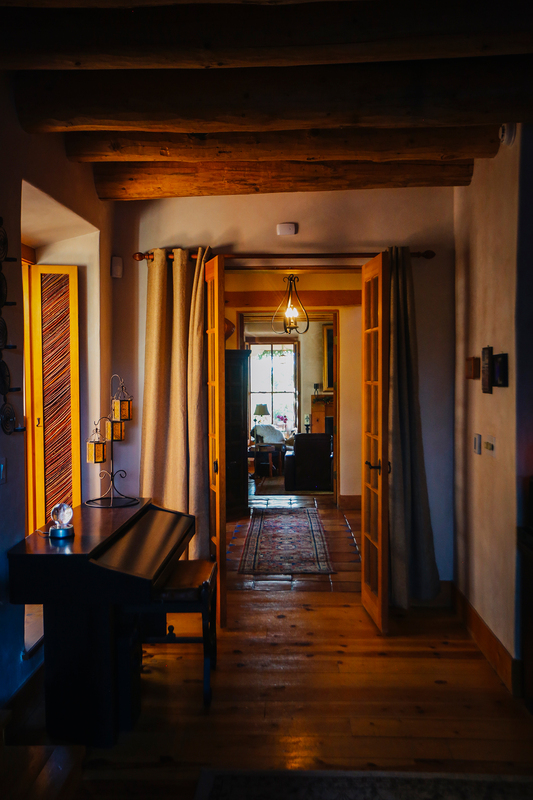 Finding a great place to stay is one of my favorite parts of visiting a new place. 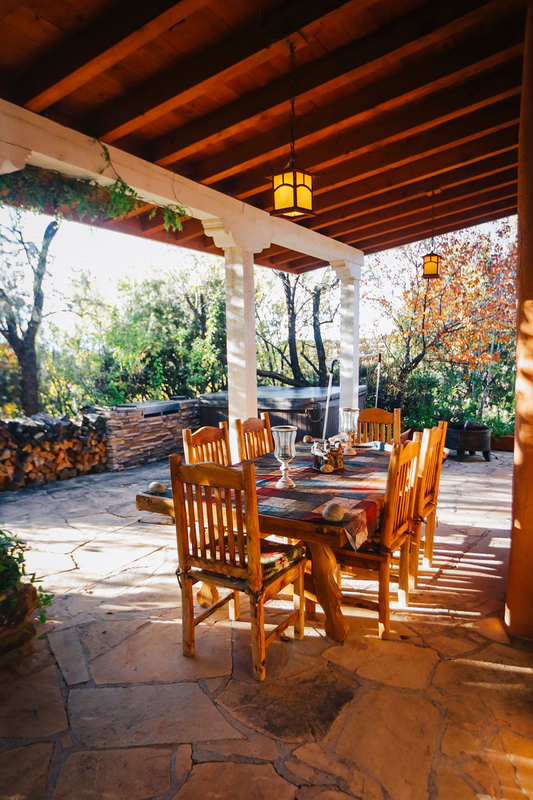 Sure, there are trips that warrant hostels and cheap motels, but if you’re looking for a bit of R&R, finding the perfect getaway home is so rewarding. 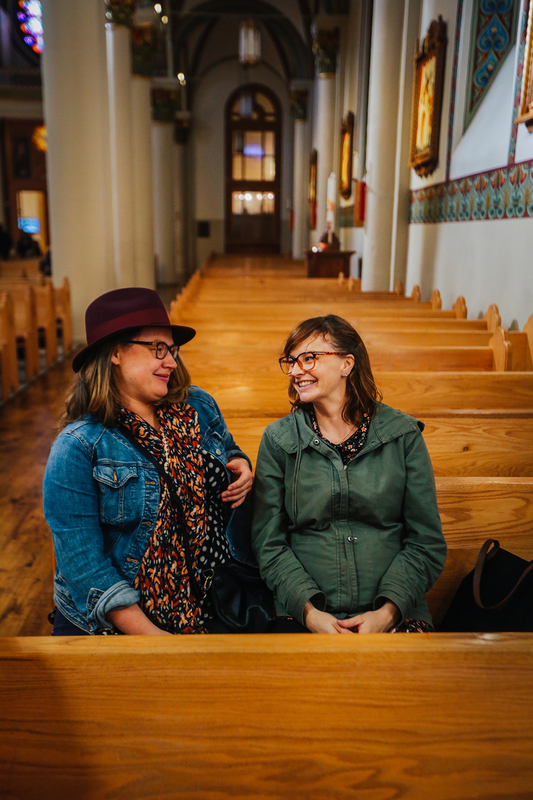 I’m lucky to have a great friend who happens to be super skilled at finding the perfect place. Our Airbnb featured a pool, hot tub, sauna and fitness room. 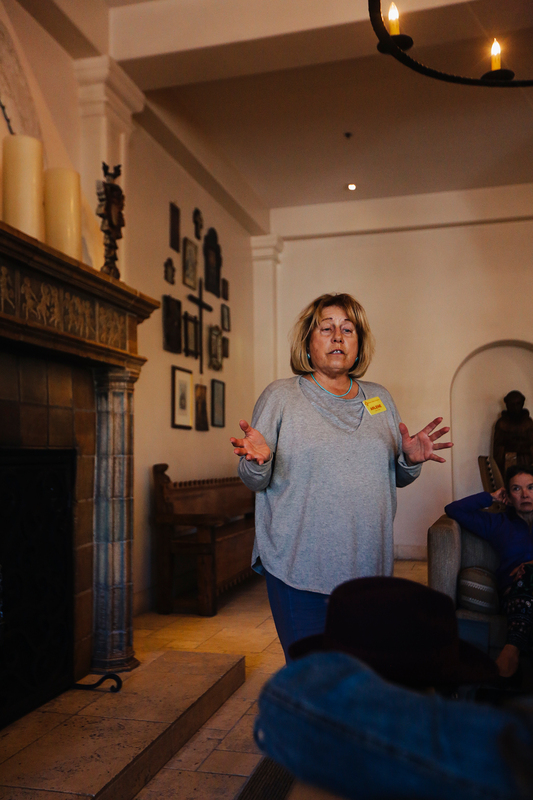 We were told the neighborhood was home to Robert Redford and Gene Hackman, but we were more concerned with the stars above, which were easily visible from the hot tub and yard. 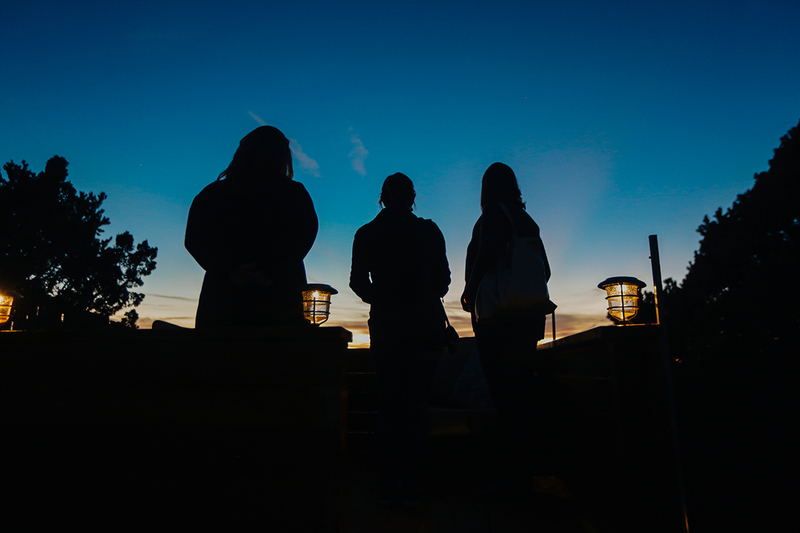 An observation deck on the property gave us a view of the beautiful Santa Fe sunset, complete with lenticular clouds and shades of purple and pink. 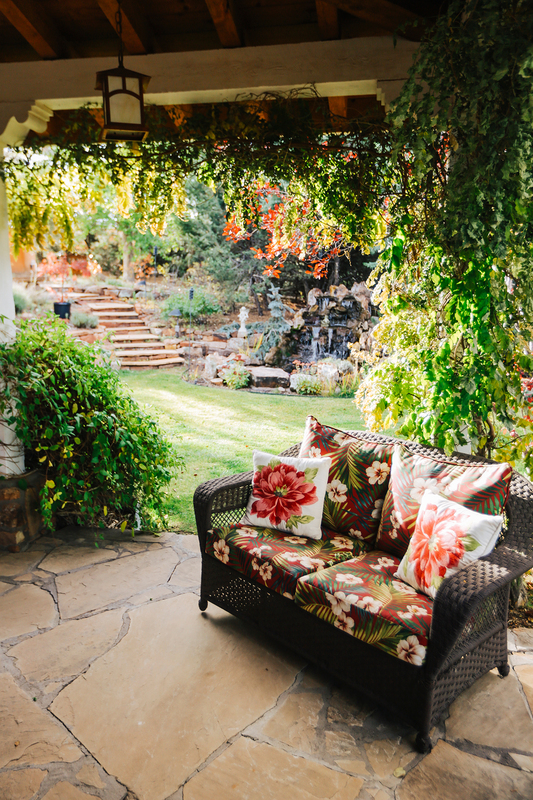 If you’ve got a big group with which to split the cost, I recommend splurging on a gorgeous house and enjoying it for all its worth. 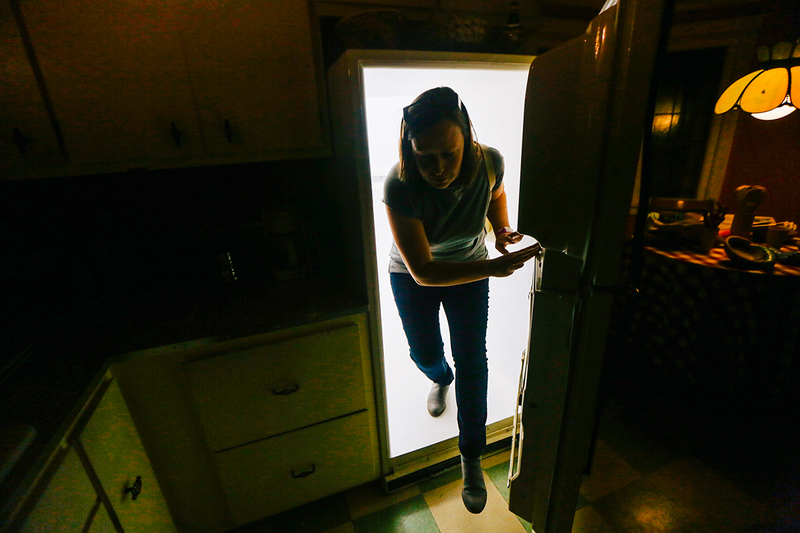 • Utilize your kitchen. Not only will you save yourself money from not eating out, but you’ll learn new recipes from your friends and have another reason to chit-chat. • Unless you absolutely need it, leave your alarm at home. Wake up when your body tells you to. 7. 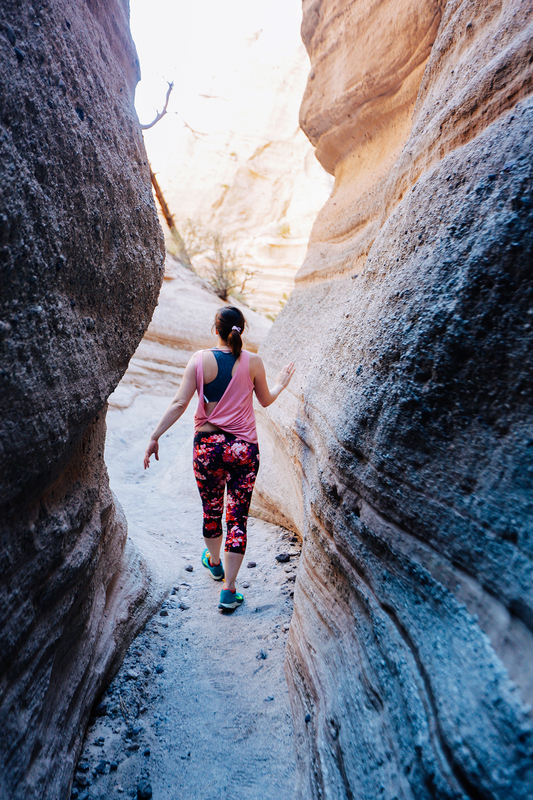 Take a hike – outside. Everywhere I travel, I try to do something outdoors. 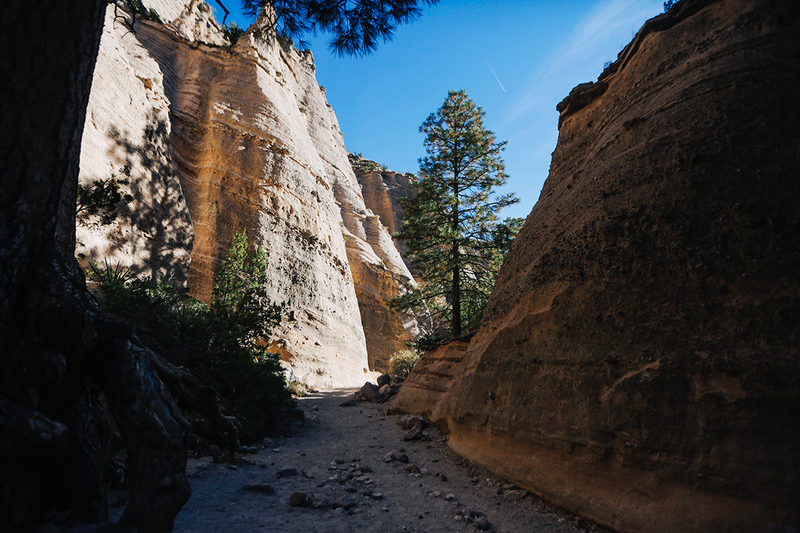 My favorite way to get outside is hiking, and Santa Fe is home to some really rad walks through the rocks. 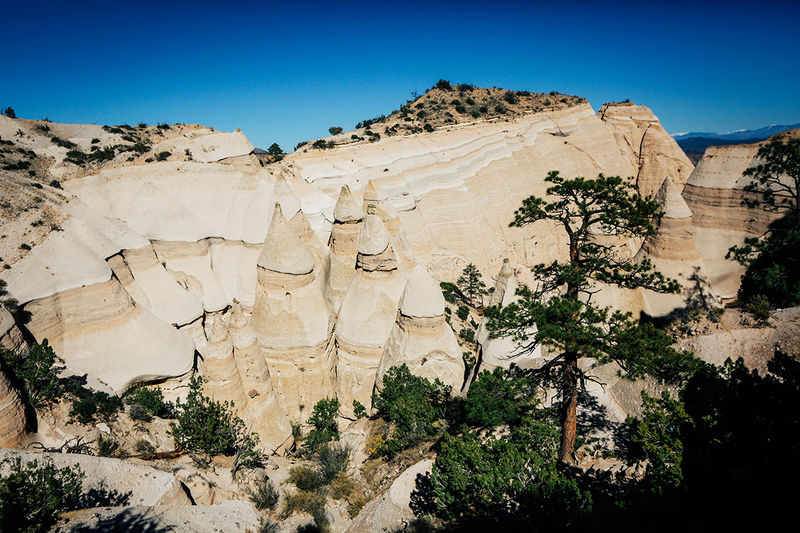 If not everyone in your party is a skilled hiker, Kasha-Katuwe Tent Rocks National Monument features an easy hike with rewarding views. 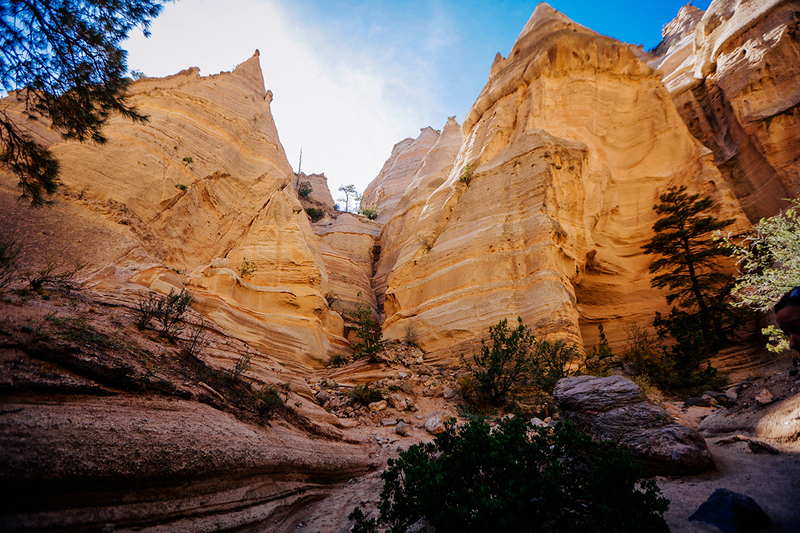 This national monument is known for its cone-shaped tent rock formations made from volcanic eruptions that occurred 6 to 7 million years ago. 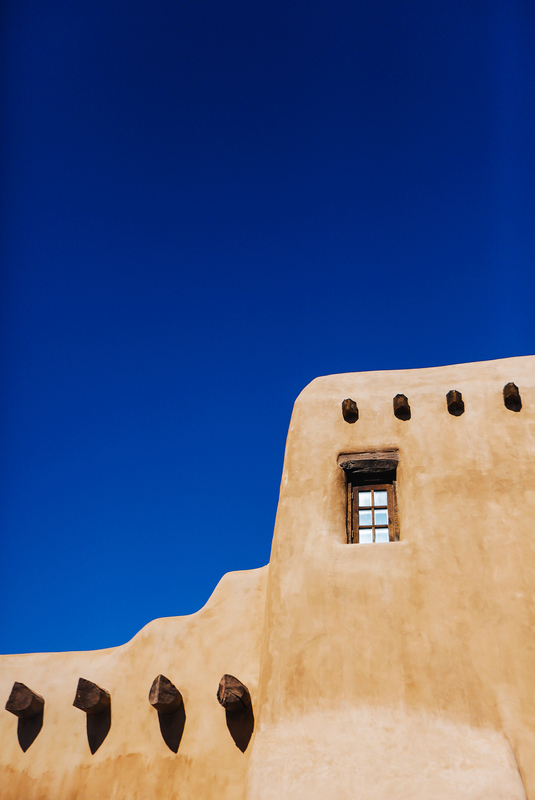 Its shades of browns and reds flash brilliantly against Santa Fe’s blue sky. 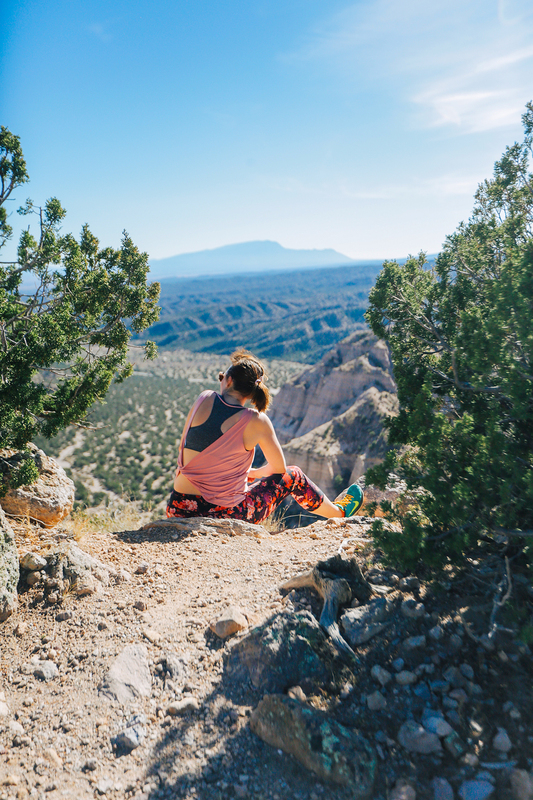 This hike does feature a bit of elevation gain, so be sure to bring lots of water and a snack or two. 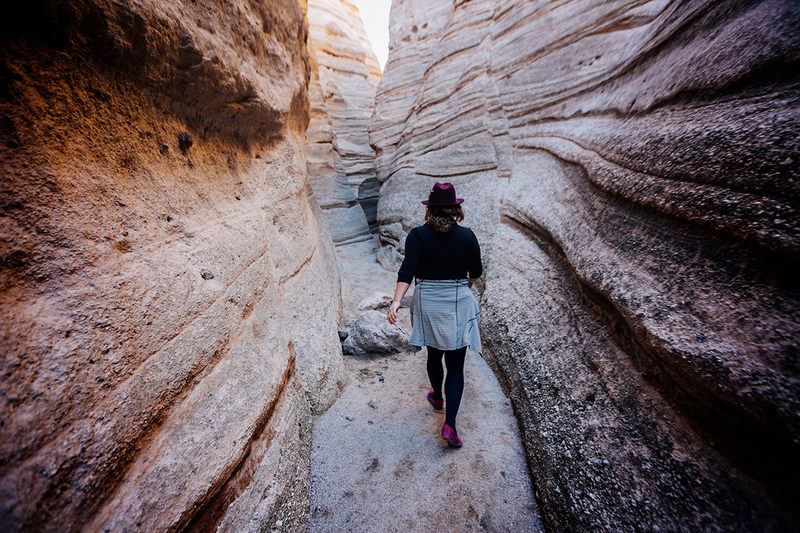 The trail is heavily trafficked and has narrow passages, so you’ll have to let others pass before you walk on. • This national monument opens at 8 a.m. and closes promptly at 4 p.m. If you are going toward the end of the day, they will close the uppermost vista by 2:30 p.m. Park rangers warn that you must get to the top by that time, or they will turn you around. They are very strict about this rule. 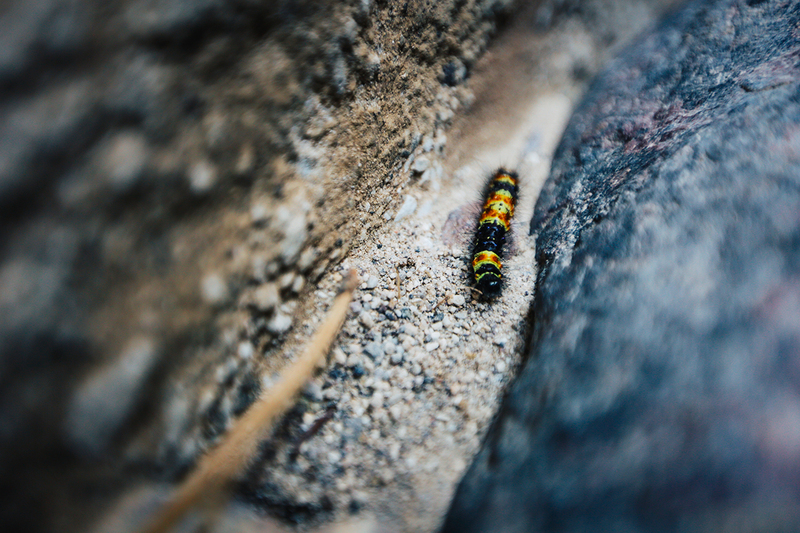 • Keep an eye out for local wildlife. 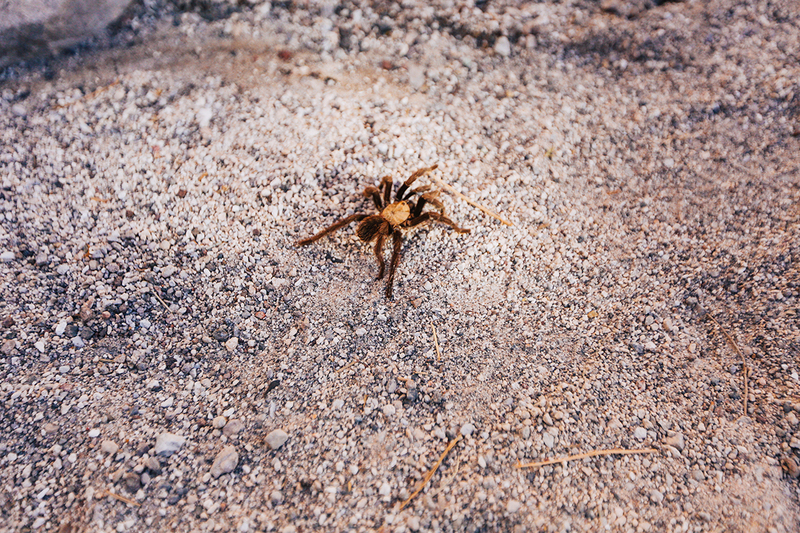 The tarantulas moved slowly and were definitely worth a closer look. 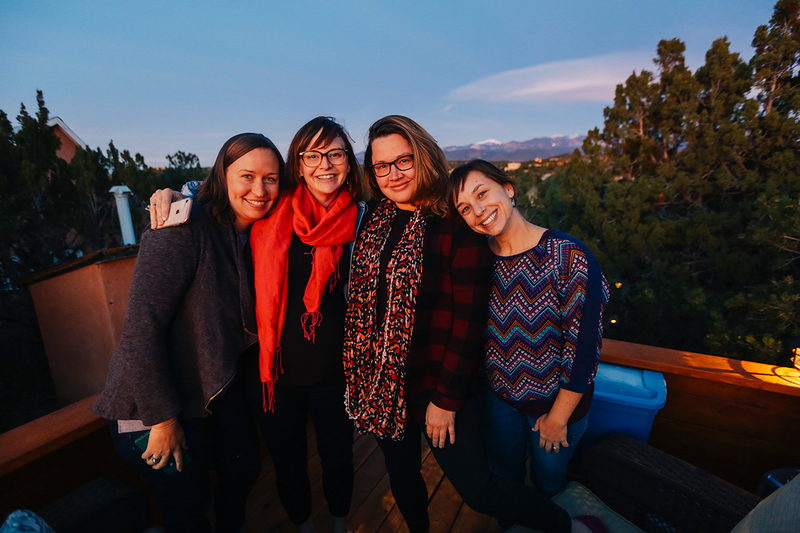 While I loved all that Santa Fe had to offer, I enjoyed spending time with these gals even more. 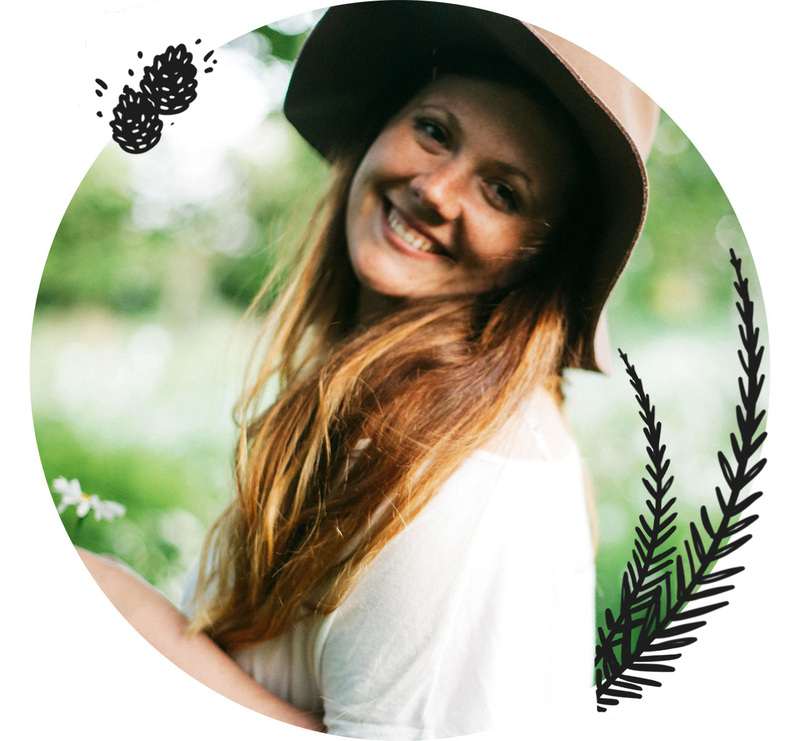 Each of these ladies feature a strong personality and a list of enviable talents. 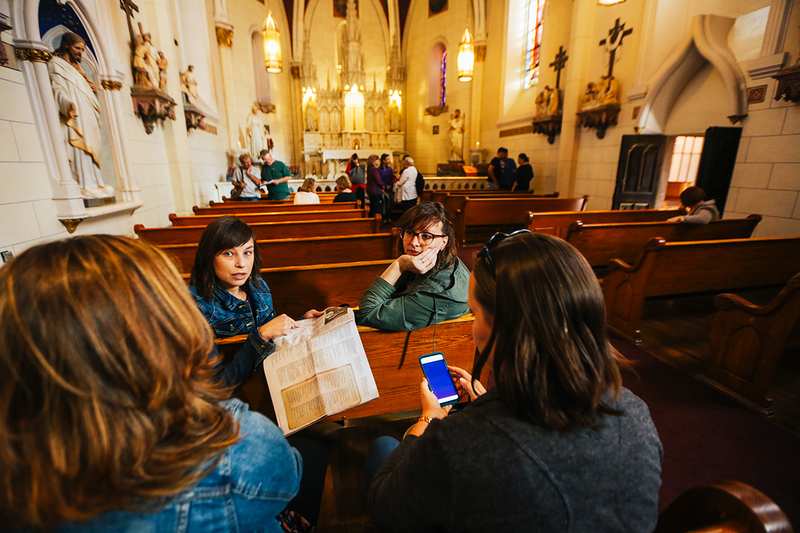 A trip like this gives room for listening and learning in a time when understanding one another can be a challenge. I am grateful for the opportunity to have spent four days with such a dynamic group. We’re already talking about where we’ll go in 2019, and Chelsea is already scouring the internet for our next Airbnb.